All aboard and giddyup for the 2013 Cowboy Poet Train on the Durango & Silverton Narrow Gauge Railroad! 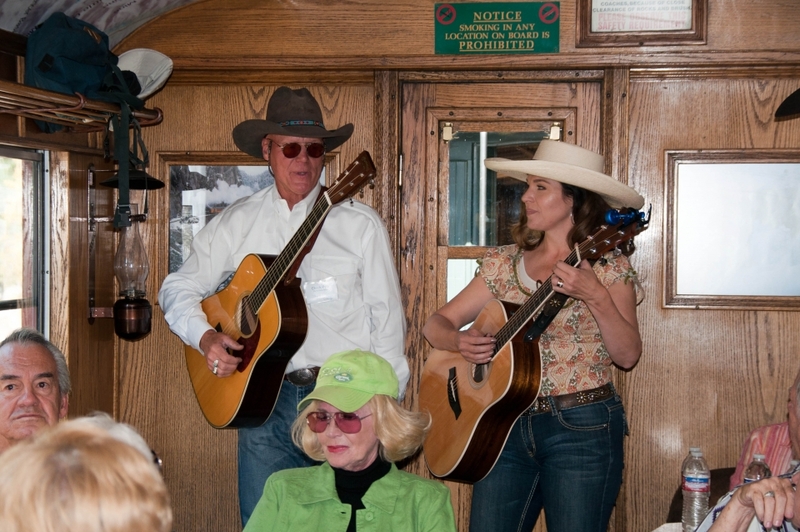 Entertainers perform aboard the annual Cowboy Poet Train on the Durango & Silverton Narrow Gauge Railroad. The Cowboy Poet Train departs from Durango on Friday, Oct. 4, and heads to Cascade Canyon. During the ride, entertainers with the Durango Cowboy Poetry Gathering will perform music, recite poetry and tell a few tall tales of the Old West, all while steaming past peaking autumn colors. The train will stop in Cascade Canyon for lunch on the banks of the Animas River. Chow down on a beef brisket sandwich, chips and lemonade while enjoying more performances by Durango Cowboy Poetry Gathering artists. Then it’s back on board the train to return to Durango by 3:45 p.m.
Book your tickets online or call 88-872-4607 to reserve by phone. The Cowboy Poet Train is just one of many events that are part of the 25th annual Durango Cowboy Poetry Gathering Oct. 3-6. See? They’re riding longhorn steer! Who knew you could ride longhorn steer?! In addition to concerts, readings, recitals and art shows at venues throughout Durango, the Gathering also features a parade at 10 a.m. Saturday on Main Avenue. 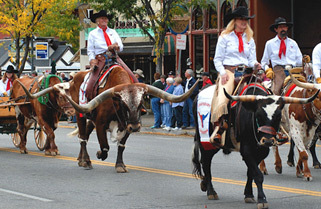 The motorless parade will feature horse-drawn wagons, riders on horseback and, um, cattleback? steerback?, and plenty of Old West period costumes. For a complete schedule of events, visit the Durango Cowboy Poetry Gathering website. The Durango Cowboy Gathering is a nonprofit that works to preserve the traditions of working ranch hands in the American West. The organization celebrates the lifestyle of rural people and brings it to the public by creating a proverbial “campfire” around which anyone can learn more about and appreciate the traditions of the West. If you don’t feel like having the full cowboy experience by curling up next to the campfire, then book your room today at the Durango Quality Inn!